It’s been more than a year since Live and Let Hike featured a hike outside of the United States (see here and here). No more. Today’s post takes us north to Canada—specifically Quebec City, one of North America’s oldest European settlements, founded in 1608 by esteemed explorer Samuel de Champlain. In the heart of Quebec City—or Quebec, for short—lies a beautiful, open park: the Plains of Abraham (or Plaines d’Abraham en francais). Situated just outside the walled city of Old Quebec, the Plains of Abraham are situated high above the Saint Lawrence—hundreds of feet below—making the heights a historically strategic vantage point and consequently, the site of two pivotal battles between British and French forces in 1759-1760. From here Avenue George VI bears southwest. 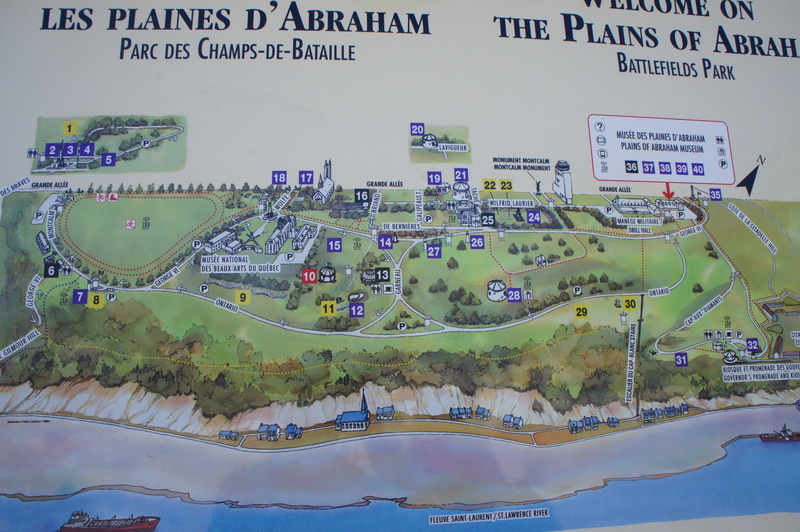 If you have time, check out the Plains of Abraham Museum on the right—which provides a good film and exhibits on the Battle for Quebec during the Seven Years’ War (a.k.a. French and Indian War). 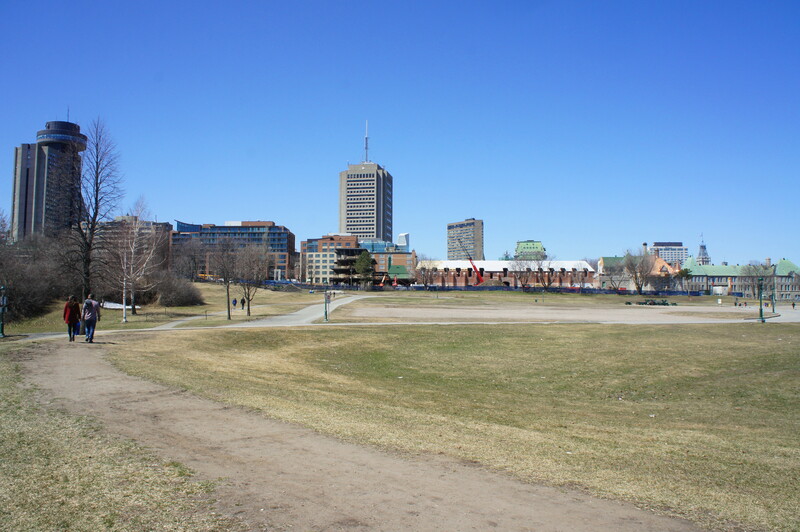 In short, the Plains of Abraham played a pivotal role in cementing Great Britain’s hold over North America in the mid-1700s, displacing the French and their American Indian allies. Quebec, strategically situated along the Saint Lawrence River, was the prize, wrestled away from the French in 1759. After three months of bombardment, British troops under the command of James Wolfe took the city in one fell swoop on September 13. The battle lasted a mere 15 minutes, but was made possible by Wolfe’s bold push the night prior to send approximately 3,300 soldiers up the daunting cliffside from the banks of the Saint Lawrence to the high plains. (Note: More than a century later, Confederate General Stonewall Jackson made a similar move to capture Harper’s Ferry, West Virginia in 1862 during the U.S. Civil War.) Surprised and outflanked, the French were routed on the battlefield in a bloody clash that took the lives of both General Wolfe and French Commander General Louis-Joseph de Montcalm. The French Army retreated, ceding Quebec—and eventually all of New France—to their British rivals; in an attempt to regain the city, French forces were defeated again at the Battle of Saint-Foy—which took place just west of here—in April 1760. A lot has changed in Quebec since the 18th century—most obviously, the modern skyline to the north—but the Plains of Abraham continue to boast many landmarks commemorating the war, including a ubiquity of cannons scattered across the park. Stay right on Avenue George VI at the next junction, continuing straight for around ¾ mile as several lesser roads jut off to the left. At 9/10 mile, at the center of the traffic circle outside the Musée des Beaux Arts, the Wolfe Monument stands as a reminder of the victorious British general who died on this exact spot in September 1759, just after learning that his troops had seized Quebec. The statue has not exactly stood the test of time: the monument is now in its fifth iteration, the previous installments having been destroyed by weathering or Quebec nationalists—who saw it as an insult to the province’s French Canadian identity. With the fine arts museum on the left, continue straight through the circle. From here a paved sidewalk follows Avenue George VI as it snakes south, flanked on the right by numerous benches and plugged cannons. It’s not uncommon to see locals playing soccer or other sports on the vast field to the right. At 1.25 miles, Avenue Ontario enters from the left; stay right. 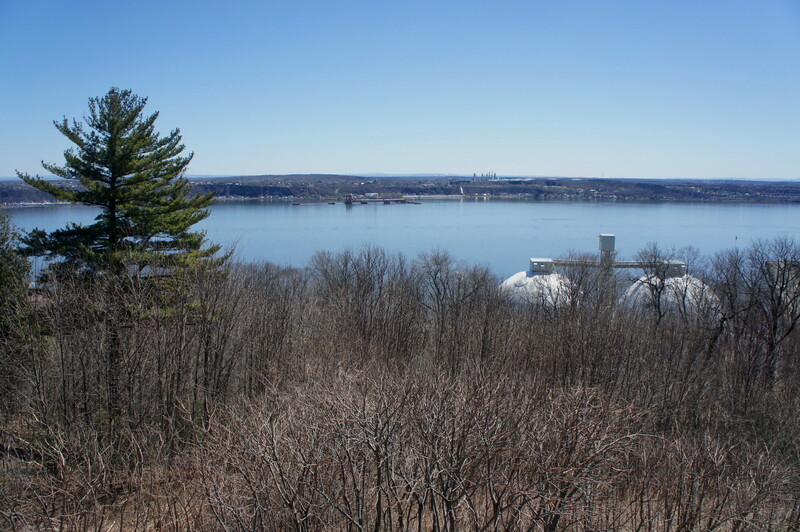 Ahead is the Grey Terrace, a decent lookout point with views of the Saint Lawrence River and Laval beyond. 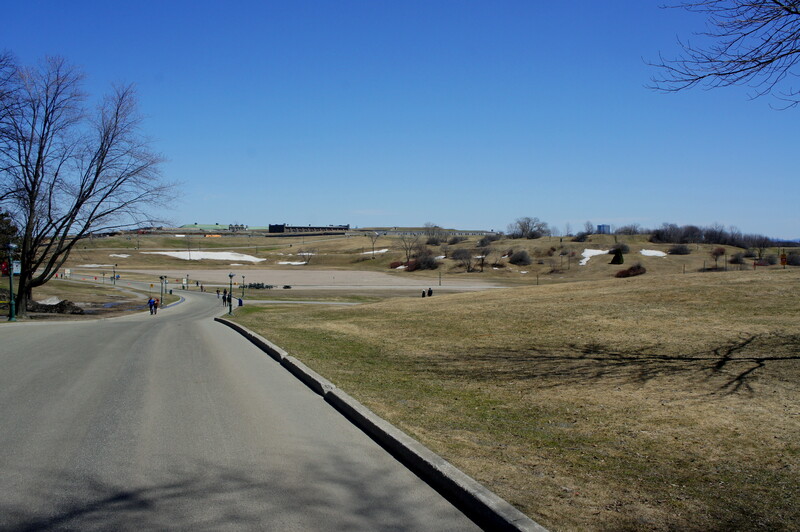 Just beyond the Grey Terrace, look for the start of a paved footpath heading left: this is the Plains of Abraham Trail, a historic walkway leading down the hillside, effectively tracing the arduous climb that Wolfe’s troops endured en route to the battlefield on the night of September 12, 1759. A short way down the path, a series of waysides provides context on the battle. After the exhibits, the path—popular with bikers—drops down Gilmour Hill, hugging the road for a brief period. Roughly 1.5 miles from the start, look for the unpaved Nature Trail—unmarked but evident—heading left into the woods. This constitutes the return route back to the start of the circuit—and a peaceful departure from the busy park. The Nature Trail is relatively level and wide, alternating between a packed dirt and gravel surface. 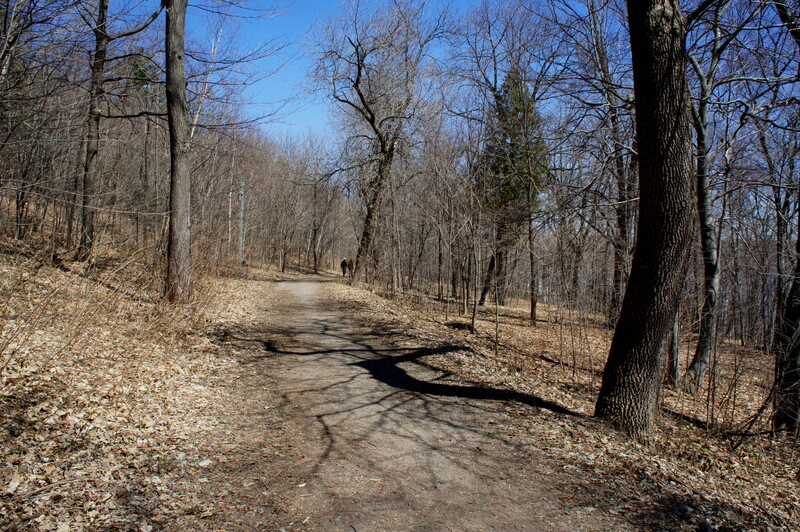 Follow the trail for 4/5 mile, enjoying the occasional but obscured views of the Saint Lawrence below, then stay right on the gravel footpath as the trail meets Avenue Ontario. The trail briefly reenters the woods, then spits out again at 2.5 miles. 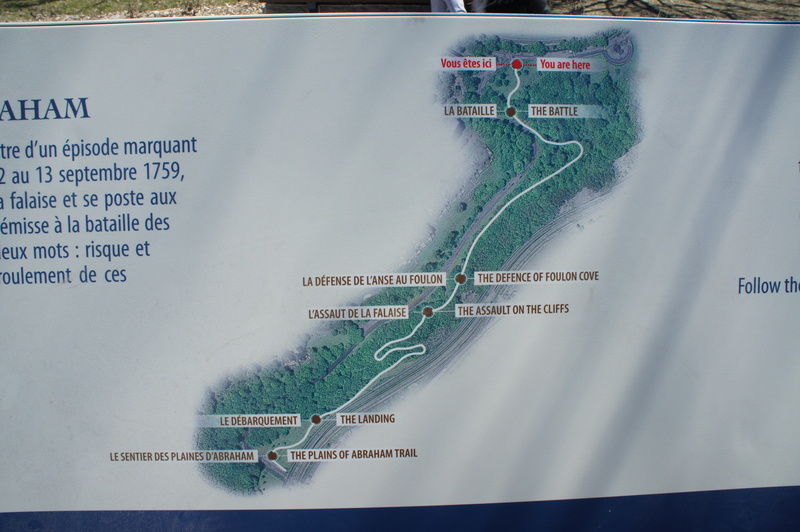 Here the Nature Trail ends and the steep Escalier Cap-Blanc (stairs) begin. Bear left, leaving the stairs for another day, and continue north on Avenue Ontario back to Avenue George VI and the start of the loop. With a little extra time, bear right on Avenue Cap-aux-Diamants, which provides access to a series of overlooks and the Promenade des Gouverneurs. 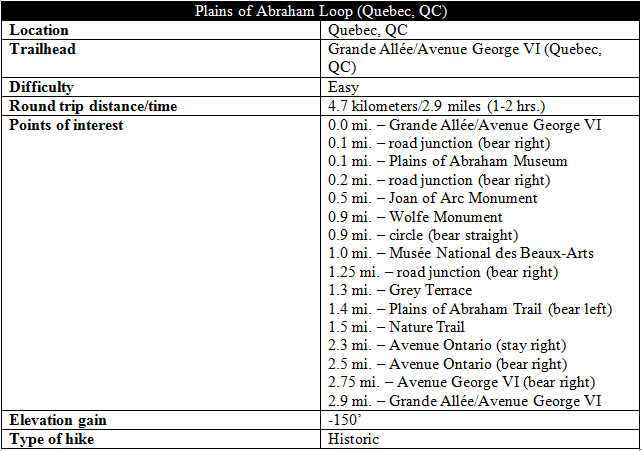 Allot 1-2 hours for an average trip around the Plains of Abraham, plus time at the museum or La Citadelle. This entry was posted in Canada, Easy Hikes, International, Quebec and tagged Avenue George VI, Battle of Quebec, Canada, Grey Terrace, historic, loop hike, Nature Trail, Plaines d'Abraham, Plains of Abraham, Plains of Abraham Trail, Quebec, Quebec City, Saint Lawrence River, Wolfe Monument. Bookmark the permalink.